EUMETNET, the Grouping of 31 National Weather Services in Europe, has begun a new programme phase. This phase will last for a period of five years and will cover the areas of Observations, Forecasting and activities in Climate and Aviation. Cooperation and sharing the burden of operating observation networks, for the benefit of all, is a core part of what EUMETNET does. Observation activities account for 80% of the EUMETNET budget. In the new programme phase which has recently begun, well-known legacy activities such as ship-based radiosoundings (E-ASAP) and surface observations (E-SURFMAR) have been confirmed and will continue with the same observation targets. The renamed E-ABO (EUMETNET Aircraft Based Observations) programme will continue to provide aircraft-based AMDAR data to the modelling and forecasting communities and is expected to produce quality controlled aircraft-derived data around major airports by 2021. The OPERA programme will also continue to pursue cooperation in European radar operations and R&D and help members to produce quality radar data and improve European-wide radar composites. E-PROFILE will continue to aggregate wind-profiler, doppler radar, ceilometer and lidar data and will explore the value of microwave radiometer data. E-GVAP (EUMETNET GNSS Water Vapour programme) will continue to increase the amount of integrated humidity data derived from Zenital Total Delay (ZTD) of GNSS systems. A new and novel programme on automatic pollen-detection network data started in 2018 and will pursue ambitious goals for 2022. 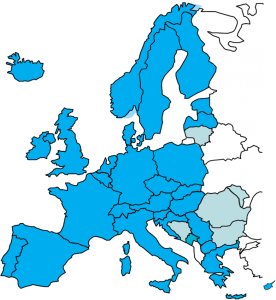 The Forecasting Capability Area is the overall name for the EUMETNET forecasting programmes. Most programmes in this area were already active in the previous programme phase but new elements have been included. 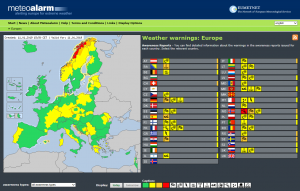 MeteoAlarm: integrated display of weather warnings all over Europe. Impact-based forecasting & warning: The most significant of these is undoubtedly Impact-based forecasting and warning. Connecting forecasting and NWP with services to customers is a core business for all EUMETNET Members. Integrating these services with end users’ business needs is becoming common practice for many sectors including aviation, civil protection and hydrology. This integration is achieved by producing impact-based forecasts and warnings where the impacts are largely determined by the user communities. Building impact databases in cooperation with the Observation Programme may be the most ambitious goal and challenge. An EUMETNET programme in this area but is planned but needs further preparation during the coming year. Short Range Numerical Weather Prediction (SRNWP) Consortia in Europe. 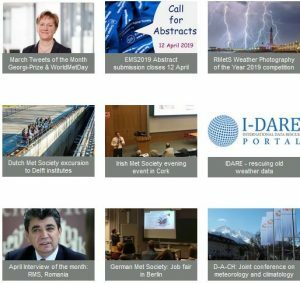 Multi Hazard Early Warning Systems, MHEWS: The flagship forecasting programme EMMA has been very beneficial to all Members and is becoming an increasingly recognised one-stop-shop where users can find aggregated warning data for Europe. Further to the role of NMHSs’ (National Meteorological and Hydrological Services) as providers of input to MHEWS, the operational service MeteoAlarm will be extended to include the hydrological community. The programme will continue to represent the aggregated authoritative voice of the NMHSs and will aid cooperation with civil protection agencies. Links with warning systems in other parts of the world will be pursued under the umbrella of WMO. Stronger cooperation among consortia and probabilistic forecasting: When forecasting risks (using probabilities as well as impacts) input from Short Range NWP Ensemble Prediction Systems (SRNWP EPS) is indispensable. The existing SRNWP consortia (HIRLAM, Aladin, COSMO, LACE, UK Met Office, SEECOP) will play a major role in translating the probabilities from EPS to impact based forecasting products required by customers and society. All Members will benefit from strong cooperation between these modelling consortia which will continue to be fostered by EUMETNET through the NWP Cooperation programme. This programme will include a new post-processing activity, where activities common to different NWP consortia will be coordinated and new techniques, such as machine learning, will be explored. Example display of the INCA-CE Nowcasting system. Seamless prediction: Another major challenge most NMHSs are currently facing is the seamless connection between nowcasting and very short range forecasting. This is the area where the human forecaster adds most value to the forecasting process. Further integration with NWP is proposed for European nowcasting development which will be fostered by the EUMETNET Nowcasting programme. Eumetcal applies hybrid training methods: classroom and e-learning. Currently E&T is primarily required by forecasters. In the newest 5-year programme a broader scope for Eumetcalis foreseen, but for reasons of efficiency it will remain part of the Forecasting Capability Area (FCA). The Eumetcal programme is closely related to programmes and modules within the FCA such as Impact-based Warnings, Probabilistic Forecasts and Nowcasting. The new Eumetcal programme will explore the “marketplace principle” to better connect supply and demand. The new phase of collaborative EUMETNET activities is built mainly on previous phases. Public funding is being reduced all around Europe and therefore a continuity of goals, at the same level as in previous phases, is an achievement per se. Nevertheless, the individual and collective endeavours of EUMETNET members will address major and exciting topics that have appeared in recent years. Migrating to impact-oriented warnings will be a major challenge for all NMHSs over the coming years. Another interesting challenge will be how to optimally use crowd-sourced data, derived data from aircraft, the internet of things and cloud services. Many EUMETNET Members are also dealing with open data policies and making data available for re-users. In particular, Copernicus services are having a major influence on the definition of what is expected from NMHSs beyond their national remits which remain their raison d’être.